The title for this outfit is taken from a song by Sarah McLachlan, singing about being alone on a winter’s night and longing for her loved one. The mood perfectly describes the loneliness one feels when traversing the Misty Mountains in Lotro. In the past people have complained that areas were unrealistic and non-immersive due to the large amount of players running around, but I assure you that going back to those older areas today, the absence of player life makes one feel totally “there”. If you are an explorer type like me, hitting the “slow walk” button and climbing up and down the dwindling High Passes is almost creepy! The sight of a campfire fills you with a sense of relief. This the first time I have used the Light Nadhin Robe in an outfit. I always thought it was a rather boring robe with limited dye options. Dyed in a lighter color and combined with these crafted fur pauldrons that form a matching and complementary layer on the right shoulder, I found a way to make it work. 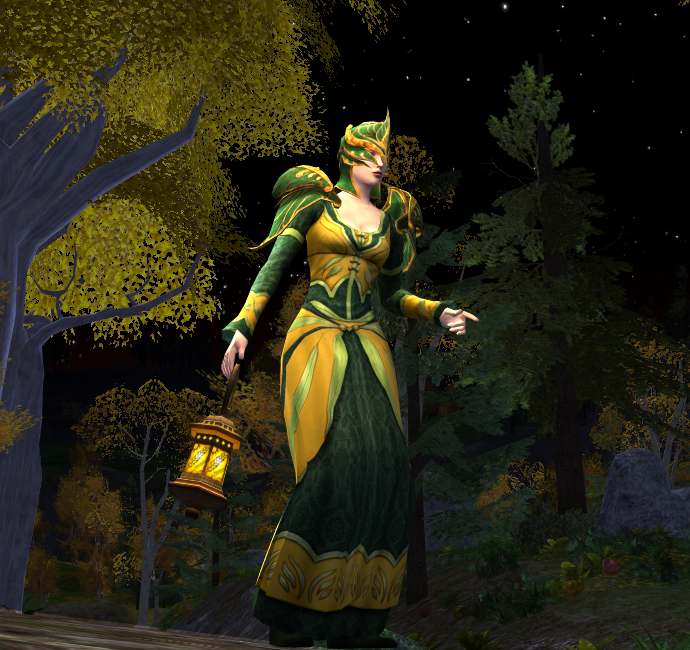 The Mammutti cloak in this outfit can be obtained in Forochel at Kindred standing with the Lossoth. However only the original version can be dyed, the ceremonial version which is also for sale, cannot be dyed. As far as I know this is true for all ceremonial Lossoth cloaks. The harp is the only one of its kind with this particular appearance. It is a reward from the epic quest line that takes one through Wildermore. It has no battle stats and is intended for musical purposes only. I have petitioned the Lotro Store Quartermaster to release the store exclusive Winter Cloaks for sale again this winter. He responded that he will look into it, so keep an eye out on the store in case you want those. Thanks Gloredh, combination even works well without the cloak. The pauldrons really stick out and form a nice shape around the shoulders. I definitely agree with Gloredh about the combination of pieces being unique! I would have never thought to combine the robe and cloak like that. This is beautiful. I love looking at your screenshots. All the elements really come together nicely. Wow!! great – almost like the Assassin’s creed characters!